Rithya S. Tang, owner of a local DNA Services of America franchise, is no stranger to risk-taking and venturing forth into new, uncharted territory. Born in Cambodia, Tang arrived as a refugee to the United States at age 5. Hard work and persistence assured him a solid education at the University of California at San Diego. When he decided to continue his education, he chose to work on his MBA at the prestigious INSEAD Business School in Singapore. With his focus on international business, Tang was successful in his role as a business development manager for a telecommunications firm in Asia. Tang said his travel schedule would take him to a different country every two weeks. “I needed to adjust to a different culture, different language, different types of food. It was really tough, but I learned a lot,” he said. His most significant accomplishment during his tenure involved signing a large telecom services deal with the Cambodian government. 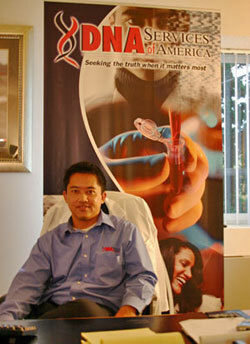 Evaluating various business options, Tang zeroed in on exploring an emerging industry: DNA testing services. Beyond its forensic and paternity testing applications, DNA testing also has applications in immigration and adoption cases. “It seemed like it was one of the things that was lacking in the community. There wasn’t much out there. I saw the opportunity and wanted to be part of it,” he said. According to Tang, DNA Services of America can provide answers to paternity and other life-changing questions quickly, painlessly, compassionately, and on a personal, face-to-face level. DNA testing services are available for a wide variety of applications: from incarcerated people who want to prove their innocence, to settling infidelity issues among partners. “Our passion is to help people find answers to their identification questions as quickly as possible, whether it is an issue of paternity that can be resolved as early as the day of birth, an infidelity question that may be interfering in a couple’s relationship and there are communication difficulties, or resolution to a criminal matter through testing biological evidence using forensic DNA technology,” he said. The need for DNA testing also is increasing in cases involving immigration and adoption from certain countries known for human trafficking, said Tang, New laws require proof of genetic match between the sponsor and the person applying for a U.S. visa. “This applies to immigrants who are already here and want to sponsor family members overseas,” he said. “In adoption cases, our role is to rule out fraud, and make sure that the biological mother of the child is indeed consenting for adoption." Educating the community about the uses and benefits of paternity testing is Tang’s foremost challenge. He frequents meetings at various trade and civic associations to talk about DNA testing services and options. “I am delighted to serve Portland, and look forward to strengthening my relationship with the community and providing answers to individuals and organizations that need our services,” he said. For more info, contact Tang at 503-206-3906 or e-mail portland@dnasoa.com. "The need for DNA testing is such a personal issue. It’s frustrating for most people who want to explore their options to call an 800 number. They have to repeat their story four to five times before they get any help."